Does your plan to create content regularly seem flawless, but circumstances sometimes make you fall off the track? Over the time, I’ve worked on quite a variety of content projects. These range from client work with various team structures, processes, and content types (blog posts, e-books, and website copy), all the way to my own content that includes blog posts, podcasts, guest blogging, and even videos in the near future. That’s a lot of content, and that’s when it becomes more likely for something to be delayed or to take more time than planned. The bad news is that you sometimes can’t control or affect every part of the process, like when your goals and deadlines depend on those of other people (and their ability to complete work in time). The good news is, there are routines you can develop to make the most out of your time. Let’s look at tools and strategies I’ve started using over time to tackle these challenges! When you’re creating a lot of the same type of content, you’ll notice you’re doing a lot of the same tasks over and over. Writing a blog post outline. Creating graphics for social media. If you have to create everything from scratch every single time, you’re spending a lot of time and mental energy on something you’ve done dozens, if not hundreds of times before. I’d argue that almost everything you do on a recurring basis can be put into a template and save you hours of your time each month. So how do you get started with creating templates? First, list all the pieces of content you create on a recurring basis. Think blog posts, videos, podcast episodes, newsletters. 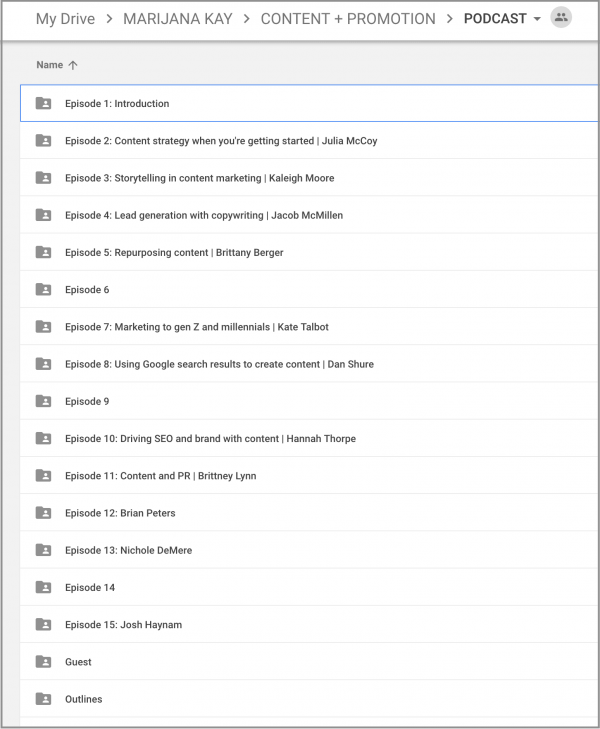 For each of the types of content you listed, write down a list of assets you create. For example, a podcast episode may have an interview, an introduction and outro, shownotes, a couple different emails for guests, and various graphics. Now, look through each of these assets. Is there a recurring theme? Is there a lot of the same stuff you keep rewriting/recreating every time? For example, it took me a while to notice I’ve been writing same things in my emails when booking podcast guests. Now, I’ve made templates that include an invitation and some initial ideas in the first email, and my Calendly link and a bullet list of interview-specific details go in the second one. Another example is creating sets of social media graphics for specific types of content and platforms. 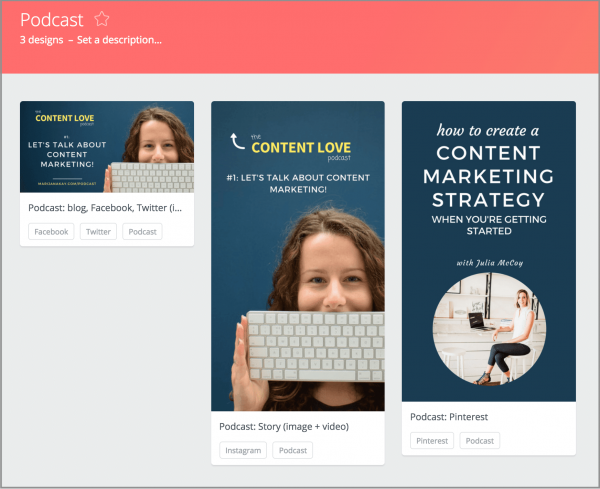 In Canva, I created subcategories for blog posts and podcasts, where I now have templates for graphics for the featured image, Instagram stories, and Pinterest. Now, I easily create a set of graphics for social media in a couple of minutes. My ‘Podcast’ category in Canva. Batching goes hand in hand with templates. It’s essentially a process of doing a bunch of similar tasks at once as opposed to having them spread out over the entire month in shorter timeframes. The reason batching works? It avoids task-switching, which makes you need more time to get stuff done. When you batch, you don’t spend any time getting focused and “in the zone” every time you need to complete a task—instead, you get a task done for the longer time ahead (weeks ahead or even a month). For example, I’m writing this exact post along with two more posts. This way, I’ll have content scheduled to go live on my blog for full three weeks, as opposed to having to set aside 2-3 hours each week to write these posts and prepare them for publishing. The second option would take half of my workday each week for three weeks, which would break the flow of my days and weeks. Instead, batching this means I’ll spend one half of my day writing these three posts, and then another hour or two to get everything else ready: social graphics, screenshots, social messages, adding links, and more. This way, I won’t have to open Canva a million times in a month, just once; same goes for Buffer, SmarterQueue, and everything else I use to get a piece of content published. Here’s how you can get started with batching. Look at your weekly schedule and identify how much time you’re spending a week creating any kind of content, including content for social media. Analyze how long it takes you to complete each task of that nature, and be realistic. Even if you schedule in an hour for something, but it actually takes you two, be honest with yourself and write the actual time you need. Look at how much time you spend per month for each of these content types. For example, you may see you spend 3 hours each week on blog posts which is around 12 hours a month, and you spend an hour each week on social media scheduling, which is about 4 hours a month. Now, what if you took this and did it all in two days instead of a little-at-a-time over a whole month? For example, if two out of three hours you spend on blog posts goes on just writing, you can batch at least three posts in a day and write the first draft. And then the day after, you can edit them, and have another 3-4 hours left in your day to schedule social media for the month. And that’s it—you’re free from those tasks for another three weeks at the minimum. Look for those threads and look for ways to batch similar tasks together. I do this with my own content, my social media, client content, podcast interviews and post-production, and really anything I can. The payoff in my productivity is worth it! This is a really simple one, but it made a whole lot of difference for me once I started implementing it. Once you define the batches you can work through, they need to get a spot on your calendar. If they don’t, other tasks will come that will fill up that calendar space, and you won’t make any use out of the batching process you defined. For example, I schedule my podcast interviews weeks ahead of the launch date, and I schedule them close enough so that I can take a Monday after three interviews and spend that day just on podcast editing: I’ll add introductions, outros, write shownotes, add links, create and add graphics, and schedule the episode to go live on a designated Wednesday at 3pm GMT. If I don’t schedule this Monday just for this process, my episodes won’t happen. My one and only tip here is to give your content its much needed space on your calendar and block out designated time to make it happen. 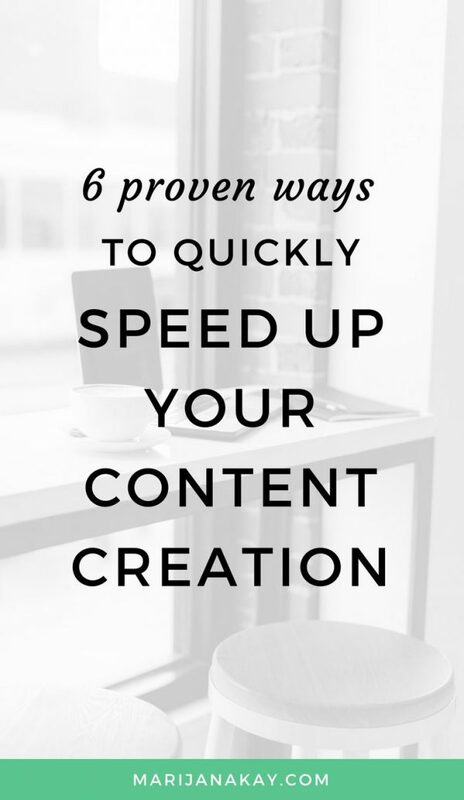 Do you have way too many drafts and versions of your content and assets that go with it? If you have drafts whose names end in _final, then _finalfinal, then _finalforreal, and you can never find what you need and when you need it, it means it’s time you set some rules to your content library. When your content library is well-structured, follows the same naming convention for all the files and folders, and is updated regularly, you’ll never have to break your productive flow because of it again. How to bring your content assets in order? Find what works for you. I use Google Drive for all my content assets. Dropbox is a great alternative. I do all my writing in Google Docs and can’t imagine working from something that isn’t as easy to share as Docs are. Put a structure in place. Different content types and platforms will probably require different folders. My folder for podcasts has a subfolder for each episode, which then has all the audio files, shownotes, and graphics. Folder with blog posts has a folder per post, each of which then has a text document and the accompanying graphics. Whatever you define, stick with it. Keep a file structure that will let you use it automatically and without too much thinking. Define a naming convention. It doesn’t have to be anything fancy, just something you can easily search for and recognize. This can include the year, month, topic, format, or ideally some combination of these elements. Review and clean up your files regularly! I’m guilty of having files pile up in my Downloads folder if I don’t save them in their designated place on the drive right away. I avoid this by quickly reviewing my files once a week to see if anything fell through the cracks. The best thing your content can do for you is to bring you reach, visibility, and conversions long after you’ve published it and paid attention to it. How can you achieve this productively? With content repurposing. Repurposing is the action of taking a piece of content you’ve already created and adjusting it to a different platform and a new format. Essentially everything I’ve learned about repurposing is thanks to the incredible Brittany Berger, a content marketing strategist and my number one resource when it comes to all things productivity. I’ve interviewed her on the Content Love podcast in late 2017 and asked her all about her magical process of content repurposing, which is exactly why I’m able to now do some of my work more productively, and help you do the same. You should plan to repurpose every single piece of your content. Instead of making this a separate process, you’ll spend the least amount of time getting the maximum results by planning to repurpose your content right as you’re creating it. Brittany even has a content repurposing planning worksheet you can use to do this! You can use content you’ve published as a blog post as standalone native content on social media that doesn’t link to anything else—it just lives as an independent nugget of value on one of your social channels. For example, you can create a short video that covers key points of your blog post—but you don’t link to the blog post, you just let this video live on its own on your Facebook page. You can repurpose long-form blog posts into email sequences, guest blogs, and joint ventures like webinars. It all comes down to adjusting to the new platform and new audience you’re repurposing for. Make sure you listen in on my chat with Brittany and watch her YouTube series where she uncovered many more awesome tips to repurpose your content. Finally, things like tools, apps, extensions and plugins are important to spend less time to get more content completed. If there’s a tool that can help you get something done quicker and better and keep you more organized along the way, I say—go for it. However, keep in mind: if your process is broken, no tool will help you. What I mean by this is that if you don’t have a workflow in place for everything in that goes on in content marketing, simply using a tool won’t make it happen. For example: if you have no process in place to come up with topics for blog posts and people in charge of writing them, a content calendar tool won’t make it better. If that happens, you’ll just have a calendar that no one will bother looking at because there’s no one with that task on their own, personal calendar. Now that that’s out of the way, here are some tools that I swear by and highly recommend you try out in your own content process. Google Docs shortcuts – if you’re using Google Docs for any writing, shortcuts will make your life simpler. Grammarly Chrome extension – sadly doesn’t work in Google Docs, but it works in pretty much everything else, including WordPress, which is great for a final proofread. Asana – all of my project management, including my content calendar, client management, and everything else that needs to get done, lives in Asana. I’m forever grateful to Megan Minns for creating a course that helped me learn everything so I can stay sane in project management. 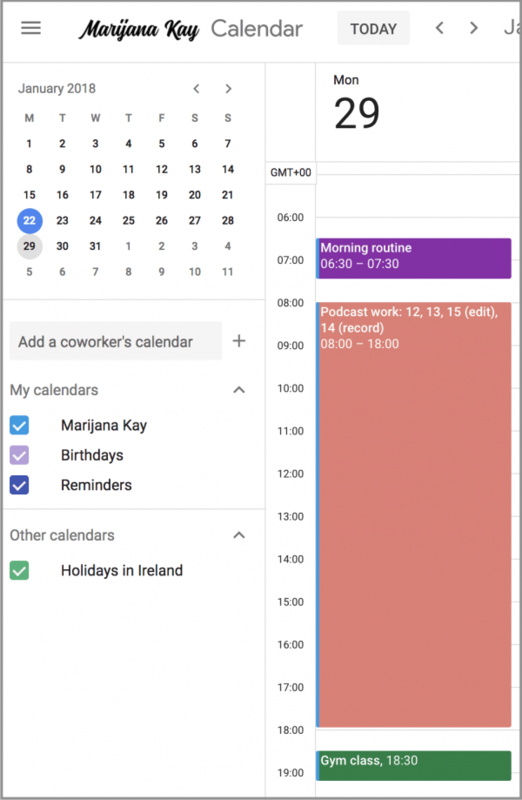 CoSchedule & GatherContent – both quite advanced tools for content process management, brilliant for larger teams and/or businesses that outsource parts of the process. I used to use CoSchedule, but once I learned how to manage my content with Asana, I fully switched to Asana as it’s a free tool. Buffer – I schedule the initial week of promotion for all my new content in Buffer. Loving it for several years now. SmarterQueue – this is where my content goes after a week for an eternal, recurring promotion. It’s a no-brainer! Later – all my Instagram posts are scheduled through Later’s free plan. If I didn’t do it this way, I’d hardly stay consistent on Instagram! BoardBooster – I’m in the process of learning the ins and outs of BoardBooster and currently setting it up, but the industry’s been raving about it for years at this stage. Pretty Links – I use the Pretty Links plugin to shorten my links for podcast shownotes, so that I can use them in the actual episode and direct listeners to marijanakay.com/9, for example, instead of a long link. Yoast SEO – great for readability checks and adding meta descriptions. Click to Tweet – brilliant for adding tweetable nuggets in blog posts. That’s it—now it’s your turn! 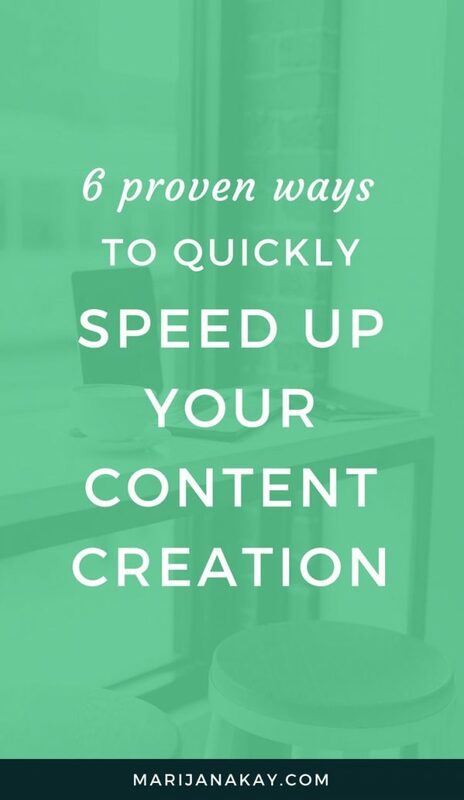 What are you doing to be quicker and more efficient in your content marketing?